The seasons move on. Soon the first cicadas will sing, signaling the end of the wet but relatively cool rainy season and the start of high summer. One way to prepare for the stifling heat and humidity is to stock up on spine-chilling horror stories. 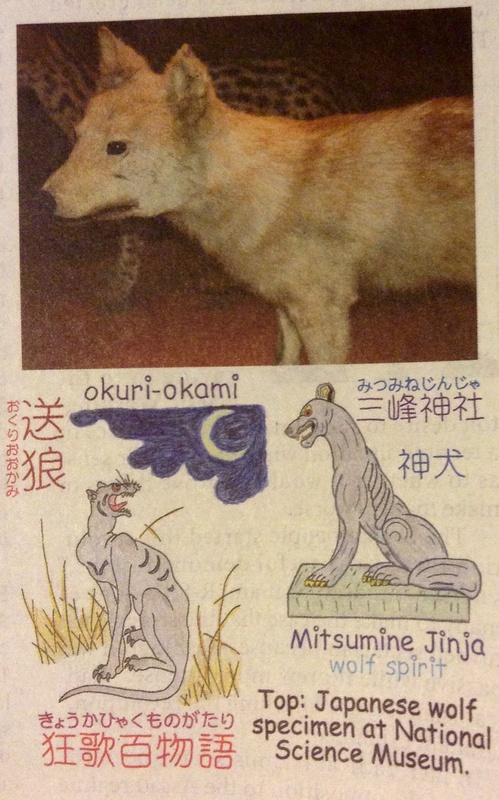 Japanese ghost tales work great, but one of my favorite chillers is the “okuri-okami” legend. More a yokai fairy tale than a true ghost story, the okuri-okami is a wolf that follows closely behind people walking along lonely country or mountain roads after dark. You can just barely hear the soft sound of something padding up from behind—but if you stop to listen the padding stops as well. When this occurs you must walk very carefully, because if you happen to trip or fall the wolf will dash up and tear you to pieces. Variations on this folklore theme were widespread throughout Japan. In some versions the wolf is replaced by a huge dog (okuri-inu). If you want to make the story relevant today, you may have to stick with the dog. The last Japanese wolf, or nihon-okami, was killed in Wakayama Prefecture in 1905. Today the species is listed as extinct. Japanese wolves once roamed the mountains of Honshu, Shikoku and Kyushu islands. These were not especially impressive critters as wolves go, being substantially smaller than the huge grey wolves of Eurasia and North America. Japanese wolves stood only a half a meter or so at the shoulder, and probably weighed only about 15 to 20 kg. In the National Science Museum at Ueno Park a stuffed specimen is displayed right alongside an American coyote, and the two species appear to be about the same size and build. Only three stuffed specimens of the Japanese wolf remain in Japan. In addition to the National Science Museum, there is one at the University of Tokyo’s Faculty of Agriculture, and another at the Wakayama Prefecture Museum of Natural History. The type specimen, which was used to make the formal biological description, resides at the Naturalis Biodiversity Center at Leiden in the Netherlands. This specimen was collected in 1826 at Osaka by the naturalist and physician Philipp Franz von Siebold, and was sent back to the natural history museum at Leiden, where the Dutch zoologist Coenraad Jacob Temminck studied and formally described the animal. Temminck determined the Japanese wolf to be a separate species (Canis hodophilax) from the common Eurasian grey wolf (Canis lupus). Later researchers, however, judged the Japanese form to be a regional subspecies of the grey wolf (C.l. hodophilax). In Japan there is still a lively controversy over this classification. One theory holds that the Japanese wolf is a relict species, the last remnant of a very primitive form of wolf that was once widespread. Later, the primitive forms on the continent were replaced by the modern grey wolf, but here in Japan they managed to survive in isolation. To help settle this controversy, the Gifu University Faculty of Applied Biological Sciences conducted mitrochondrial DNA analysis of samples taken from wolf skulls and bones from various areas of Japan. The results indicated that the Japanese wolf is indeed a subspecies of the continental grey wolf. A small number of wolves may have entered Japan from the Korean Peninsula during the glacial period. Afterwards, when the earth warmed and sea levels rose, the Japanese wolves were cut off from the continental populations. As is often the case when continental animals migrate to islands, the Japanese wolves gradually became smaller in size. The Japanese wolf began decreasing in numbers after the Meiji Restoration of 1867. One reason was certainly the introduction of gun hunting. Contagious diseases such as rabies may also have been a factor, as well as general loss of habitat. The Hokkaido wolf, or ezo-okami, a different subspecies of the same grey wolf (C.l. hattai), was also wiped out by the late 19th century. Some researchers continue to insist that the Japanese wolf represented an independent species. Others even believe that the species may be still extant. The official interpretation is that the wolf has been extinct since 1905, but there have been numerous sightings afterwards. The most notable of these is a series of photographs taken in the Chichibu Mountains of Saitama Prefecture in October of 1996. The animal in the photos closely resembles the type specimen in Leiden, especially in the very small ears and black-tipped tail. A close look at the photos, however, shows a ring of worn fur around the animal’s neck, indicating that it formerly wore a collar. Despite being such a small animal, the Japanese wolf was frequently portrayed as dangerous in Japanese folklore. In the Chichibu and Okutama Mountains west of Tokyo, however, the wolf was traditionally revered as a messenger or familiar spirit serving the local kami deities. Keeping a wolf skull or wolf charm in one’s home was thought to ward off burglars and other misfortune. Wolf spirits are still worshipped today at the Mitsumine Shrine in Chichibu. Short is a naturalist and cultural anthropology professor at Tokyo University of Information Sciences.